« Object Score Notation online! 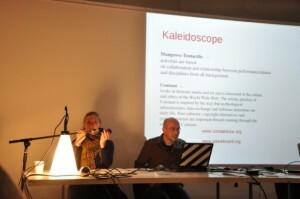 The presentation of Kaleidoscope raised many questions during the brunch discussion the next day. The discussion these questions generated for Dorothé & Simon nourished our project the days after, so thanks Make Art! Posted by admin on Saturday, November 13th, 2010 in: Lectures, Report. Both comments and pings are currently closed.